In partnership with Wargame Vault, Historic Imagination brings you this exciting scenario book for American Civil War miniature games! 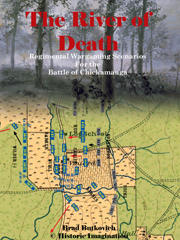 Refight the Battle of Chickamauga with these thirteen scenarios designed for the miniature wargamer in mind. From the opening volleys at Jay’s Mill to the final shots at dusk on Horseshoe Ridge, try your hand at fighting history. Or changing it! These scenarios are designed to be used with almost any American Civil War regimental level set of rules. Rules are included for figures based on 20, 30, 40, 50, and 100 historic men per figure/stand. Times are given for 10, 15, and 20 minutes per game turn. Maps are in full color, as are the numerous color photographs of the modern battlefield. Also included is a full and complete Order of Battle for each side. "Brad Butkovich is to be highly commended for this effort! As a long-time scenario designer with several books of my own, I can appreciate the amount of time and effort (not to mention research and reading) that Brad must have put into this project."